A fundamental shift has occurred in the way startups are financed. Much of the progress companies used to make with Series A capital is now being accomplished in their seed phase. Meanwhile, Series A investors are applying investment criteria traditionally reserved for the Series B. To study this shift, Wing has developed a curated data set focused on the industry’s higher quality startups and used it explore what’s actually happening in early stage financing. The result is Wing’s “V21 analysis”. It includes only technology companies financed by one of a select group of the industry’s top venture firms. It is no secret that most startups fail, and that returns for the median venture firm often lag the S&P 500. The V21 data set represents more of the quality and less of the clutter. It captures the details of 5,600 financings at 2,785 companies invested in by one of 21 elite venture firms across 8 years. Companies are raising a lot more seed capital than ever before. . In 2017, the average company had raised a total of $6.3M prior to raising a Series A, up 4.5x from $1.4M in 2010. The size and number of individual seed financings has grown considerably. The average seed financing in 2017 was $3.3M, up 3.3x from $1.0M in 2010. There are also more of them, with the average company executing 2 discrete financings before raising a Series A. Companies are increasingly mature by the time of their Series A. Companies completing a Series A in 2017 were 3.3 years old on average, up from 2.1 in 2010. 67% of them were generating revenue, up 6.1x from 11% in 2010. Series A financings are larger than ever before. In 2017, the average Series A was $12.1M, up 2.5x from $4.9M in 2010. The size of financings has escalated almost an entire “alphabet rung”. 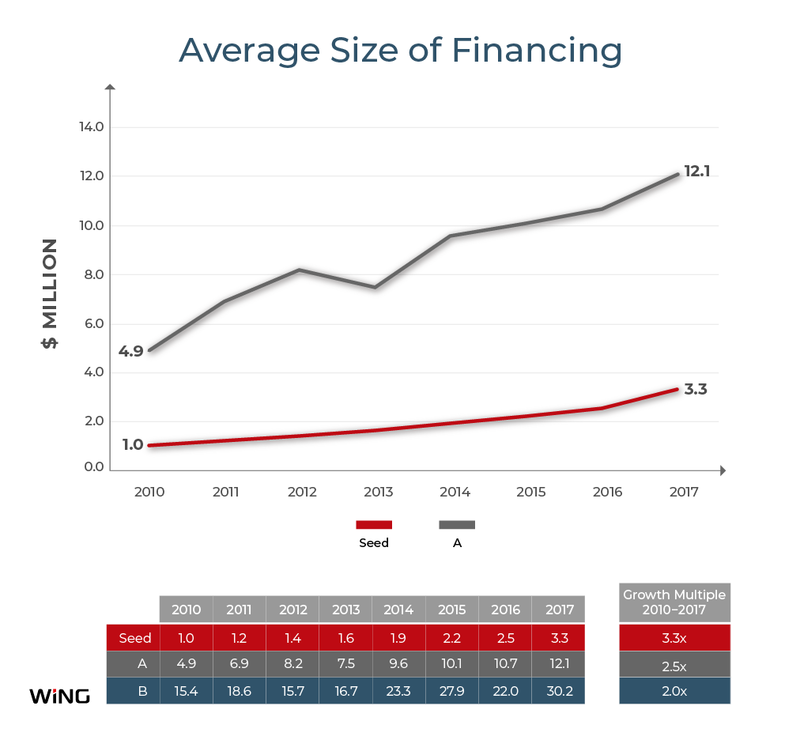 Average total financing prior to Series A reached $6.3M in 2017, actually exceeding the average Series A of 2010 ($4.9M). Similarly, the average Series A in 2017 ($12.1M) was comparable in size to 2010’s average Series B ($15.4M). On dimension after dimension, seed financing has assumed the role once played by the Series A, which in turn now looks very much like a “traditional” Series B. Why is this “venture capital grade deflation” occurring? What does it mean for entrepreneurs and investors? Where will this shift take us next? More than financial nomenclature is at stake. The answers have profound implications for all participants in the startup ecosystem. The future success of an early stage venture is not yet known. To focus on the highest quality companies, you need a proxy for company quality that is observable in the present. The one we chose in creating the Wing V21 is the quality of the investor. There is a lot of research support for this choice of proxy. Analyses from academics, limited partners and even venture capitalists show that fund returns and top-performing companies are disproportionately concentrated in the portfolios of the very best venture firms. Of course it is true that even the best firms often make bad investments, and mediocre firms sometimes make good investments. But it is also true that the highest quality firms vastly outperform the rest, with strong persistence effects. By focusing on the investment activity of the top firms only, we are able to create a sample that better represents the companies that matter. Today’s V21 starts with the identification of a group of 21 leading venture firms with a focus on the US technology sector. This is a subjective selection, performed by the partners of Wing, based on our deep experience in the industry. The firms in the sample are all best described as “Series A” or “multi-stage” firms. The group does not include seed funds, although many of the firms in the sample make seed investments as part of a broader strategy. This should not be interpreted as a negative statement about the importance of seed funds (on the contrary, as latter sections of this paper will explain), but rather the recognition that the portfolios of the leading major venture firms contain the highest fidelity signal. The best portfolio companies of the seed funds are usually also captured in this sample, but with less accompanying noise. While we do not reveal the names of the 21 firms, it is fair to say that if we did, there would likely be no disagreement concerning 10 of them, broad consensus on 5, and lively debate concerning the remaining 7. Having selected our 21 firms, we next identified every company in which one of them has made a new seed, Series A or Series B investment from 2010 to 2017). These “V21 companies” form the backbone of the data set. It is worth noting that a follow-on investment from a V21 firm is not enough to include that company in the set – the investment must be the first time that firm has invested in that company. Finally, we collected information on all seed, Series A and Series B financings for V21 companies – their longitudinal financing histories. All in, the V21 data set captures the details of 5,600 financings at 2,785 companies invested in by one of 21 venture firms across 8 years. The focus of the V21 analysis is technology venture investing in the US. We specifically exclude companies in obviously divergent sectors and geographies. Some exclusions: no later stage investments, no growth equity; no life sciences; no China, no India. V21 companies in more closely aligned geographies and sectors, like Europe, Israel and Health Care IT, were left in the sample, but since the V21 firms are all US-based and technology focused, this is a relatively small proportion of the overall data set. As always, there are some problems with the data. Worth calling out is the question of convertible debt. Industry data providers will typically include this capital in the financing to which it converts, even though it was invested and spent well prior. A very common example is a seed note that converts into the next round of priced equity (for example, the Series A). Because of this, it is likely that the V21 analysis actually somewhat understates the amount of seed capital companies are raising. An alternative analysis would be a study of the financing histories of known success stories. How were Dropbox, Mulesoft, AirBnB and Nutanix built? Trouble is, those companies were founded in 2007, 2006, 2008 and 2009, respectively. Their early-stage financings are reflective of a very different time. This type of analysis is still incredibly useful (and we do it ourselves) but answers different questions. We analyzed a large number of factors related to the V21 companies and their financings. 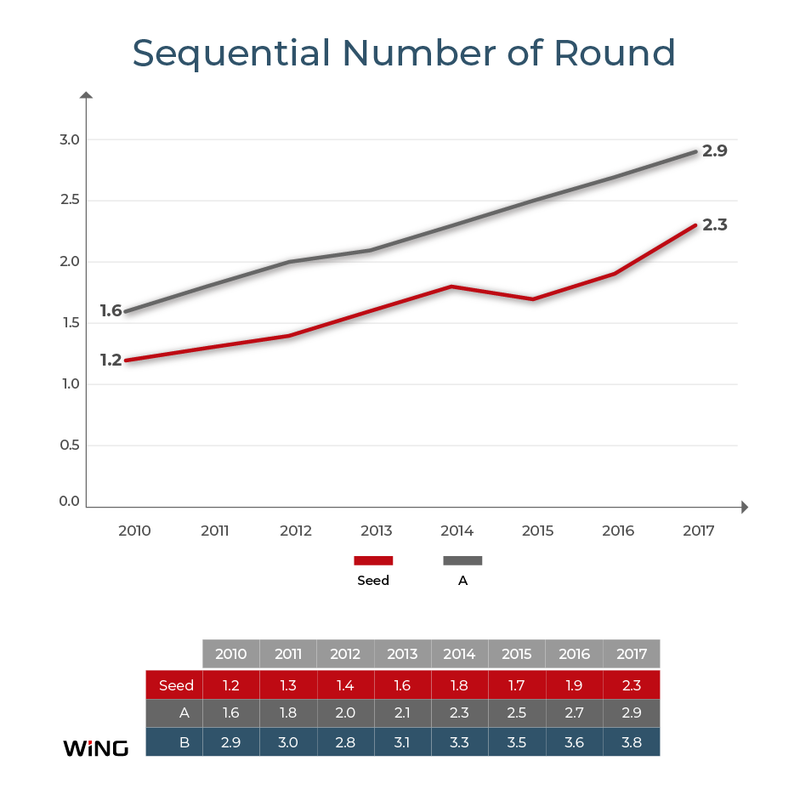 During the study period of 2010 to 2017, we see a marked increase in the size of seed, Series A and Series B financings. We also see an increase in the number of discrete seed financings per company. The rise in the size and number of seed financings has resulted in a large increase in the amount of capital V21 companies are raising prior to their Series A. 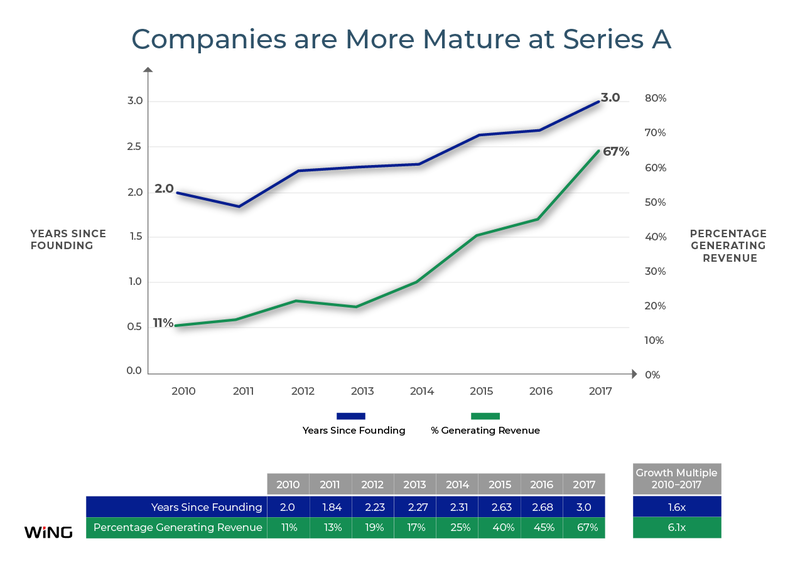 This has gotten to the point where cumulative seed capital raised by the companies that completed their Series A in 2017 has surpassed the average Series A of 2010. Unsurprisingly, average valuations have also increased. This is true of seed, Series A and Series B financings. It is worth noting that V21 valuations have actually declined moderately in recent years, with Series A and B peaking in 2015, and seed peaking in 2016. Another striking set of findings is related to company maturity at the time of various financings. Companies are older at the time of their financings (including the seed financings, probably due to the fact that companies are often raising multiple seed rounds). Companies completing a Series A in 2017 are now 3.3 years old! 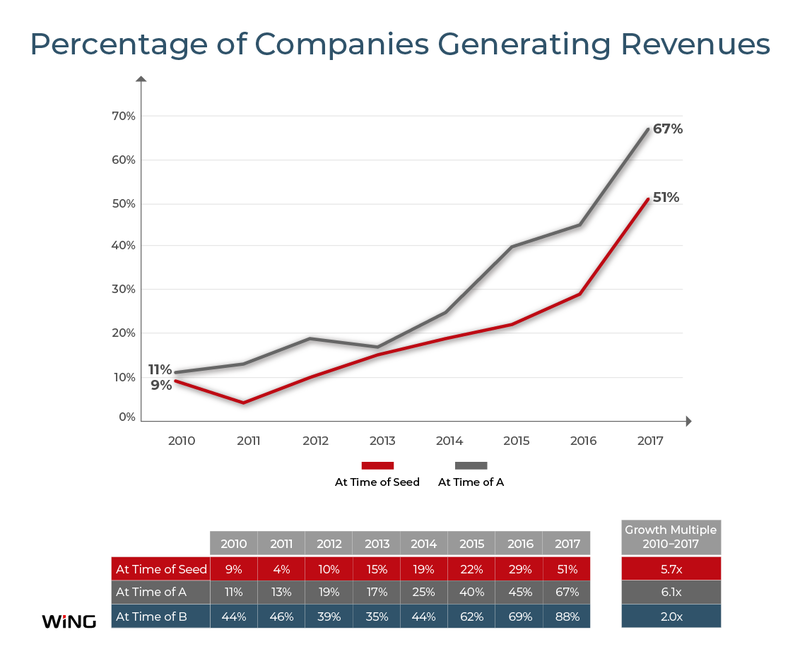 Additionally, a large and growing proportion of them are generating revenue (in 2017, more than half of the companies completing seeds were revenue-generating, and two-thirds of those completing Series A’s). We also analyzed the investor makeup of the financings. 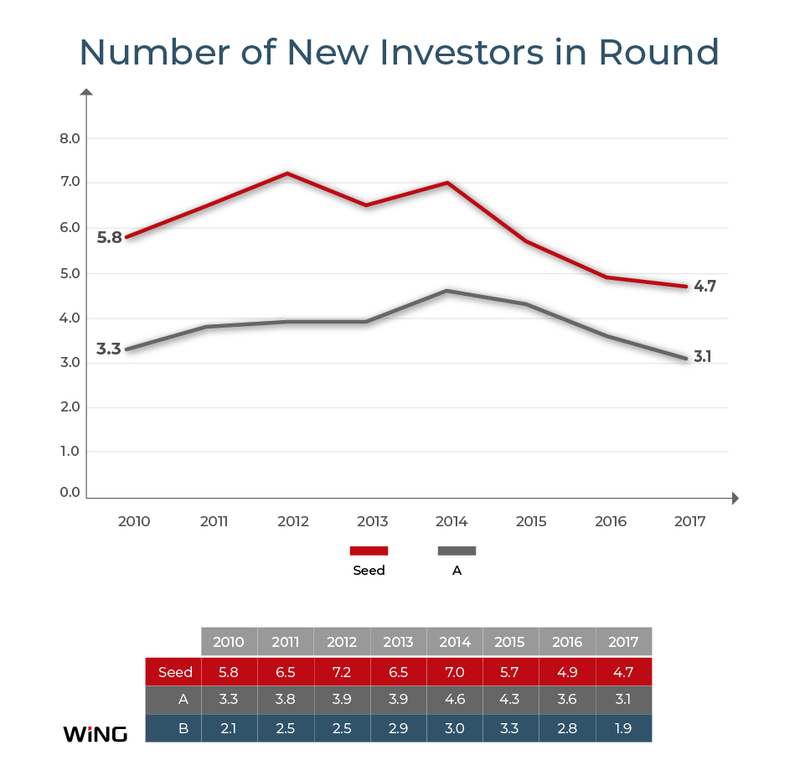 There has been a material decrease in the number of investors (and the number of new investors) per round in recent years, and a consistent increase across the entire study period in the proportion of rounds with a designated lead investor. There has been a broad increase in the sizes of discrete financings of all classes. 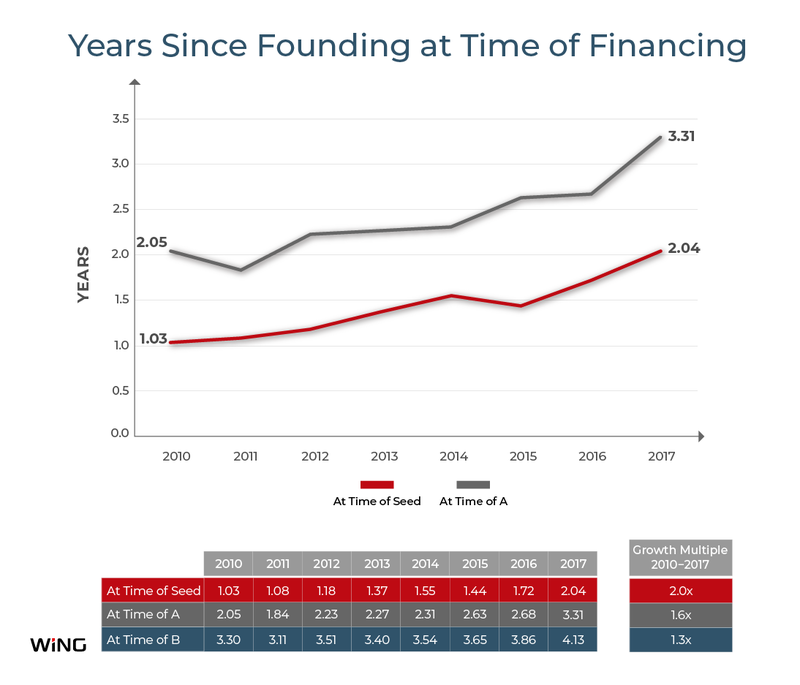 The increase in the size of seed financings has risen without interruption, while the Series A saw a modest pullback in 2013 before resuming its climb. Series B’s have been more volatile, with steeper increases as well as more frequent pullbacks (2012 and 2016). By 2017, the average seed round had more than tripled since 2010; the average Series A was up 2.5x; and the average Series B had nearly doubled. The “cross-class” comparisons are also instructive. The average 2017 Series A had reached 78% of the 2010 Series B; and the average discrete seed had reached 67% of the 2010 Series A (a comparison that does not include the additional effect of multiple seeds per company). “Sequential Number of Round” in the V21 analysis indicates the chronological sequence of a financing. Is it the first? Then it is “round number 1”, and so on. Since companies almost always raise only one Series A and one Series B (though we have certainly seen a few A-1’s out there! ), the increase on this measure is attributable to the phenomenon of companies raising multiple rounds prior to their Series A. The average seed round number in 2010 was 1.2, which means almost all of them were first rounds. By 2017 the average seed round number had reached 2.3! With more rounds of larger size, it should be no surprise that the cumulative early stage capital being raised by V21 companies has grown dramatically. Cumulative capital raised “Prior-to” is the total capital a company has raised prior to a particular financing. 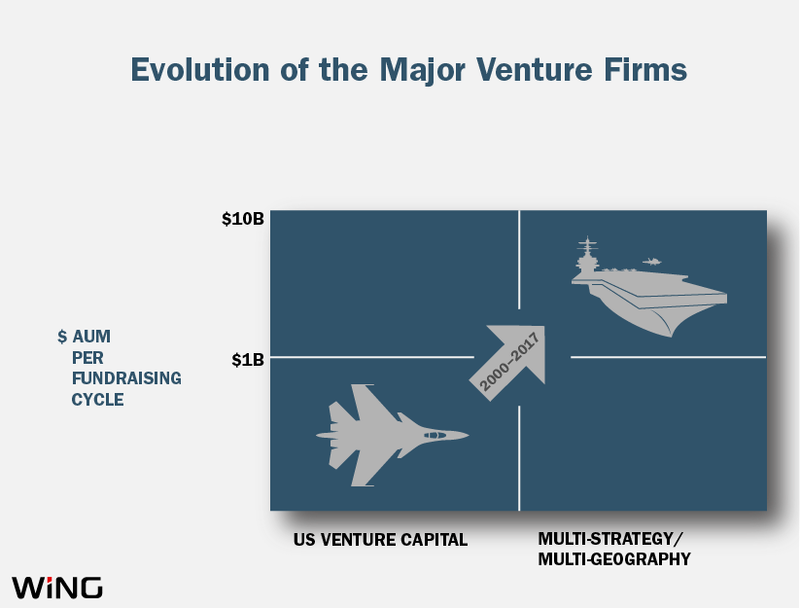 This is the most definitive measure of the growing role of seed capital in the development of a V21 company. The starkest increase in “prior-to” capital is associated with the Series A. V21 companies raising Series A’s in 2010 had raised an average of $1.4M beforehand. By 2017 this number had ballooned by an incredible 4.5x, to $6.3M. Capital raised prior to the Series B grew at a smaller but still material factor of 1.6x from 2010 to 2017. Seed financings themselves also saw an increase in “prior-to” capital, from a negligible $100k in 2010 to a $800K in 2017, a reflection of the increasingly common practice of companies raising multiple seed rounds. Given the multiplicity of seed rounds, it has become fashionable to classify an early financing as “pre-seed” and a more advanced pre-Series-A financing as “seed-plus”, terms we find both humorous and telling. 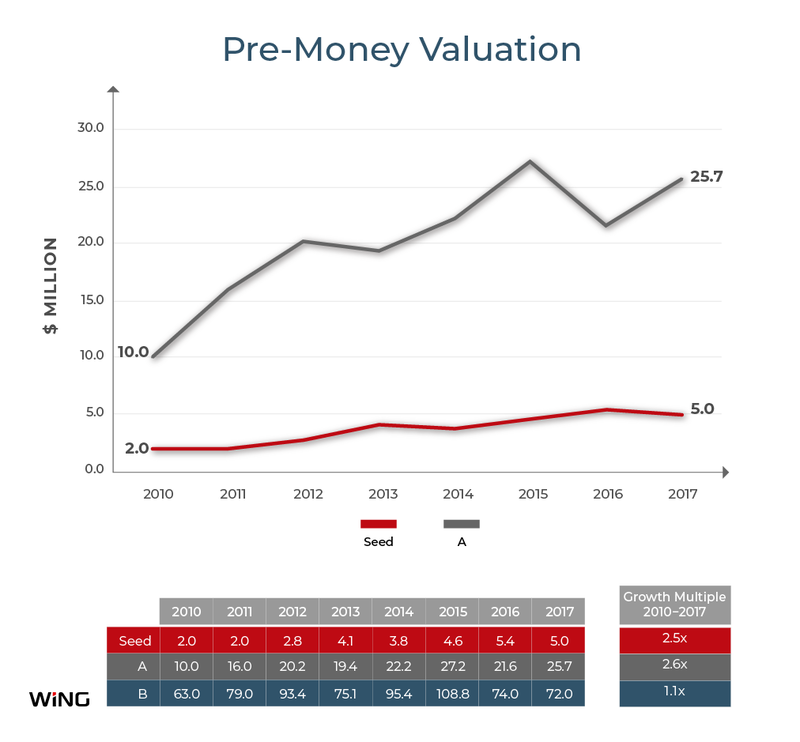 Average pre-money valuations for seed financings (including all seed financings regardless of whether they are the company’s first, second, or Nth discrete round) rose from 2.0M in 2010 to in 5.0M in 2017, a factor of 2.5x. Series A valuations rose by a nearly identical multiple, from 10.0M in 2010 to 25.7M in 2017. Of potential interest is the slight decline in valuations in most recent years. The average Series A valuation peaked in 2015 at 27.2M after 6 consecutive years of increases; the average seed valuation peaked in 2016 at 5.4M after 7 consecutive years of increases. Series B valuations also peaked in 2015 at 108.8M (falling to 72.0M by 2017). Valuation statistics are often sparse and inaccurately reported, so the above figures should be considered a “sample of a sample” with some unknown error factor as well. The fidelity is higher for the Series A and B financings, where 75% to 90% of them include a valuation figure depending on the year. Seed valuation data is sketchier, with 35% to 60% including a valuation. The V21 analysis also considers several characteristics of the companies themselves at the time of their various financings. One of them is their age, as measured in number of Years Since Founding. In 2010 the average company age at the time of a seed round was 1 year, at the time of a Series A it was 2.1 years, and at the time of a Series B it was 3.3 years. By 2017 all these numbers had increased by about a year: seeds to 2 years, A’s to 3.3 years, and B’s to 4.1 years. The trend in Years Since Founding for the Series A cohort is probably the most definitive (since there is almost always only one Series A per company), and these companies are now over 3 years old on average. This is a far cry from the classic de novo Series A investing that was the norm 15 to 20 years ago. Back in 2010 revenue generation was the exception, not the norm, for companies completing early stage financings. 9% of companies completing a seed financing had crossed that threshold, and importantly only 11% of Series A companies. Even at the time of the Series B, only 44% of V21 companies were generating revenue. 2017 offers an altogether different picture. 51% of companies completing a seed financing were generating revenue, 67% for the Series A, and 88% for the Series B. This figure has grown very rapidly in the last few years. Taken together, the trends in both Years Since Founding and Revenue Generation indicate the V21 companies are now far more mature at the times they have completed their various financings, relative to companies completing those same classes of financing in prior years. The V21 analysis shows an increase followed by a decrease in the number of investors in a given round. This is true both for the total number of investors in a round, as well as the number of new investors in that round, and it is true for seed, Series A and Series B. 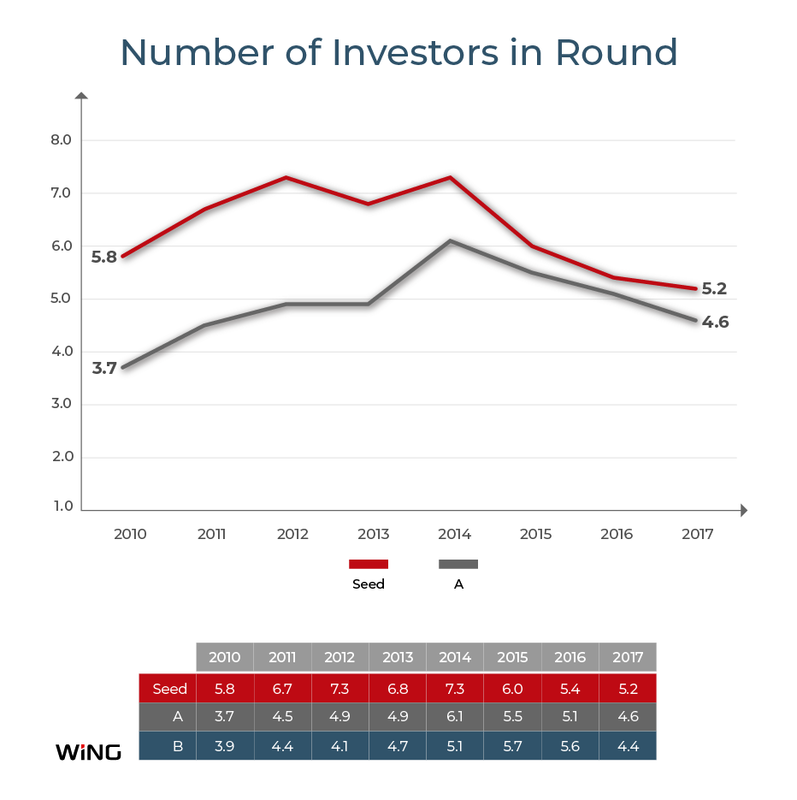 For seed and Series A investors, the reduction is most pronounced starting in 2014, with investor count per round actually increasing from 2010 thru 2013 before turning downward rather steeply in 2015. The downturn for Series B investor count kicked in a year or two later. 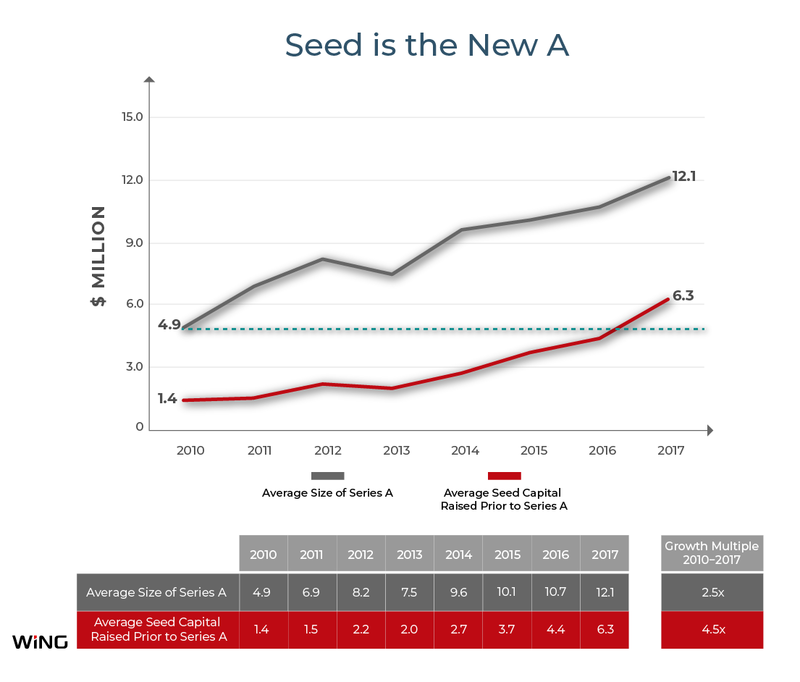 The peak is highest and the decrease sharpest for seed rounds, possibly indicating that such financings are less broadly syndicated than in earlier years. Coupled with the fact that seed financings (and indeed all financings) are increasing in size, we see a picture of fewer investors investing more dollars. This may be an indicator of some moderate level of consolidation, but the trends on the investor count measures are not nearly as clear those seen in other measures we studied. Synthesizing all these findings, a fairly clear picture of early stage financing dynamics emerges. The space occupied by seed capital has expanded enormously. The Series A has grown and moved to a later stage of company development. By 2017, these shifts were of such magnitude on every metric that seed financing had fully occupied the territory once held by the Series A. The Series A, meanwhile seems to have moved on to the (greener?) pastures traditionally served by the Series B. Describing the shift in early stage financing is a pretty data-intensive exercise, as we have seen. Identifying the drivers of the shift requires a more strategic analysis and an understanding of the motivations of the players involved. The shift is happening primarily because all the investors involved believe it to be in their interests. Major venture firms (like those in our V21 sample) see an opportunity to manage vastly more capital and invest it with less risk, improving their General Partner economics in the process. Seed investors see an opportunity to expand their role in a company’s life-cycle and claim a larger share of future gains. The two groups of investors have built a largely symbiotic relationship, and the sunny economic environment since 2009 has helped both parties achieve their goals. The expanded role that we’ve observed for seed capital, and the later-stage nature of the modern Series A, are both reflections of investors redefining these financings to fit their evolved strategies. Prior to year 2000, the leading venture firms were all early stage focused, and predominantly enterprise oriented. By today’s standards, fund sizes were modest and teams were lean, consisting primarily of General Partners who sourced their own deals, led investment decisions and helped build companies directly. When I joined Accel Partners in 1996, we had just raised our largest-ever fund (the $150M Accel V). Our technology investment team consisted of 3 GP’s plus 2 Associates (partner-track apprentice investors, of which I was one). The entire rest of the firm consisted of two part-time venture partners, a 2-person health care team that would soon be spun off, and our back office. Things changed rapidly in and around 2000, propelled by the dot-com boom. The leading firms raised considerably larger funds, topping $1 billion in several cases. Once the wreckage of the ensuing bust was cleared away, a select number of firms also embarked on product line and geographic extensions. These firms included obvious “bulge bracket” names like Accel, Greylock, KPCB and Sequoia. Dedicated growth funds were raised, along with Europe funds, Israel funds, China Funds and India Funds. Assets Under Management (AUM) grew rapidly for these firms, until the Great Recession hit in 2008 and injected a pause in the escalation. More recently, emboldened by the long boom since 2009, a broader group of firms has tried to join the party, bulking up with more dollars managed in more pools of capital or gigantic global, stage-agnostic vehicles. Raises $1 billion or more per fundraising cycle. This could be in a single large fund, or the aggregate of a family of funds. Except for a handful of firms that have consciously chosen to stay dedicated to their early stage craft (Benchmark being a prime example), the V21 today are all either fully operational aircraft carriers, or feverishly trying to become one. Capital has gravity, and it exerts an inexorable later-stage pull on investment strategy. Larger investments in more mature companies have to play a more prominent role for an aircraft carrier to deploy its rapidly scaling assets under management (AUM). Time-intensive early-stage projects become harder to justify. A lot of the incremental capital that has been raised by the V21 since 2000 comes in the form of growth funds (or growth strategies within a single very large fund), often twice the size or more of the “venture classic” funds. The growth funds are staffed according to a pyramidal organizational model, leveraging large numbers of junior professionals focused on sourcing and diligence, who support a small number of investing partners. These teams use a different decision-making methodology than is typically seen in early stage venture. They emphasize quantitative analysis of adoption metrics (such as cohort analysis or sales rep productivity), things that don’t exist for early stage companies that are setting out to define new markets and haven’t yet shipped a product. Another critical trend of the early 2000’s was the rise of consumer technology investing. In the early 90’s, most technology venture capital was focused on companies that built products for businesses. “Consumer” in those days often meant things like physical retail businesses. This changed in the late 90’s with home run investments in the early consumer internet (e.g. Amazon, Yahoo). The dot-com crash put a chill into this sector, but by 2003 the Web 2.0 renaissance was underway and the leading firms were building vibrant consumer practices. At first these firms utilized their standard early stage playbook, investing in Series A’s to fund de novo Powerpoint-grade concepts. But the best investors soon realized the difficulty of predicting consumer behavior and chose to wait for measurable evidence of market adoption – the all-important “inflection point” – before committing, even though this meant paying a higher price. 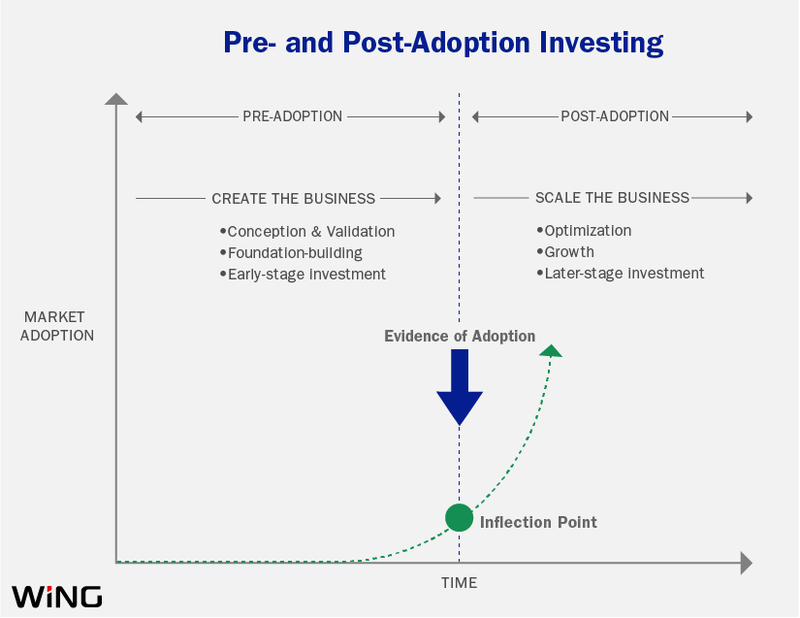 Interestingly, this data-driven, post-adoption investment methodology actually had a lot in common with that of the new growth teams. The fish out of water, methodologically speaking, was early stage enterprise technology. Once the heart of these firms, this practice found itself somewhat out of step with its booming brethren in consumer and growth. Even though business buying behavior is far more predictable than that of consumers, pre-market-adoption investment decisions became difficult in partnerships populated by metrics-driven consumer and growth investors. Additionally, given the rapid rise in AUM, it became increasingly difficult to justify spending senior partner time on small but time-intensive early stage investments. Enterprise investors in these firms adopted the metrics-driven methodology of their colleagues, and more and more enterprise companies looking for classic Series A startup capital were told to come back when they had 10 customers or $1M in annual recurring revenue. 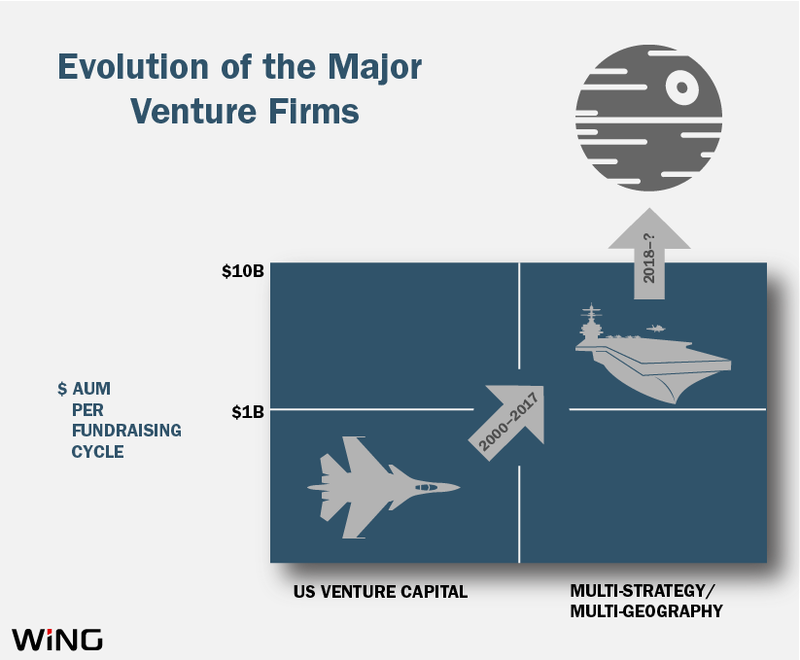 The aircraft carrier effect has pushed the V21 toward later-stage investing where market adoption is already evident and large amounts of capital can be deployed. However, these are firms that pride themselves on their early stage chops. It would be very bad for their brands if they were redefined as Series B, C and D investors. Such firms have traditionally been looked down upon by the elite Series A firms as followers if not lemmings! It is important to the V21 to hold the high ground of Series A branding, and a clever way to accomplish this is to change the definition of a “Series A-ready” company to align better with their new later-stage investment strike zone. Series A financings have become, by definition, whatever a “Series A firm” chooses to invest in. None of this would have been possible without the cooperation of seed investors. These folks – individuals, accelerators, seed firms – were already playing a key role in early stage financing in the early 2000’s. At first the major venture firms regarded them as a potentially dangerous disintermediating force driving a wedge between the venture capitalist and the founder. Eventually the V21 came to regard seed investors as useful proxy forces willing to take risks they were unwilling to and invest sums too small for them to justify in their scaled-up business models. Seed investors have been the willing accomplices of the V21, helping launch a fleet of a thousand ships from which the major firms could pick and choose at the time of the Series A. Smart seed investors realized this arrangement was very much in their interest. They had relatively free-reign in the pre-market-adoption part of the venture market and were able to benefit from the resources of the V21 when it came time to scale the company. A large group of seed firms shaped their strategies so as to be explicitly non-competitive with the major firms. Often these groups would tout the rate at which their companies received an investment from a “top tier” venture firm as a key benchmark of success. A financing life cycle relay developed, in which seed investors carry a startup through its first lap and then pass the baton to a major firm to run the rest of the race. As the V21 got comfortable with this arrangement, they demanded even more hard evidence of traction from potential investments. This created both an obligation and an opportunity for seed investors, who now had to run a few more laps. The result is more seed capital invested in more rounds, with the Series A reserved for further-developed companies. The seed investment universe itself segmented and developed its own handoffs. The most common of these involves the growing role of accelerators, who hand off companies to seed investors, who then lead the charge to the Series A. Limited partners have been an important enabler of the shift. You can’t have an aircraft carrier without large amounts of capital, and since 2009 institutional investors around the globe have been eager to fund the growth of the V21’s AUM. The most sophisticated LP’s often decry this growth as having a negative effect on fund returns, but for the most part still answer the bell when the V21 is fundraising. LP’s will be less excited to fund these bigger broader strategies if returns disappoint, but the long bull market has served to keep returns high (enough) even as more and more LP capital is poured into later-stage investments where return expectations have historically been lower. Rising valuations and expansion of multiples have thus far held up, allowing fundraising to remain brisk. Seed firms have also received an increasingly warm reception from LP’s. Sometimes these are the very same institutions funding the V21, perhaps through an emerging managers mandate. In other cases they are wealthy individuals, usually successful entrepreneurs in their own right and often former colleagues of the seed firms’ GP’s. The influx of capital into the seed investment community has been critical in enabling it to fill the vacuum created by the V21’s retreat. The shift in early stage financing dynamics sets the stage for the next evolution of the venture capital industry. Seed investors have benefitted from expanded dominion over what has historically been the most strategic part of the financing life cycle. But with this comes responsibility for critical company-building. It is not clear all seed investors want this responsibility, and even less clear that they have the capability to be its effective stewards. The earliest stages are where the foundation is built and where the die is cast. Decisions made at this time shape the company’s entire history and are incredibly difficult to reset later. It used to be that only the most accomplished venture capitalists were entrusted with this charter, and the best founders sought out their help even if it came at a steep price. Seed investors aiming to fill these shoes need to fully embrace the long-term role of the early stage lead investor, which runs a lot deeper than attractive terms and founder-friendliness. If Seed is the New A, What is the New Seed Firm? Looking forward, we expect to see at least two trends in the seed community. First, some seed investors will seize the opportunity presented by the expansion of the seed phase. They will do more of the foundation-building that the V21 firms used to do and continue to guide their companies throughout their later stages. They will scale in terms of both capital and resources in order to meet this task. The basis for competition in this category of seed investing will change to emphasize selectivity and company-building capability, as the best entrepreneurs flock to the early stage investors that can help them be most successful – as they always have. The seed firms that make this transition (and some of the best are already well down the path) will have the opportunity to dominate a big segment of pre-market-adoption investing and establish themselves as the founders’ go-to partners for the long haul. The second trend is increasing segmentation. Sub-specializations will develop as the seed territory expands. The stunning rise of accelerators provides an already obvious example. As seed segmentation plays out further, the result may be an increasing number of baton passes in a lengthening seed phase relay, with “pre-seed” firms focusing on the first lap (de novo investing) while larger, more established seed firms aim to intercept companies once they have made more progress. Maybe we will even see groups arise to focus on “post-seed” or “seed-plus”, a kind of mezzanine finishing school before the Series A debutante ball. Sound familiar? This trend constitutes a reprise of the symbiosis that has developed between seed and Series A firms over the past 15 years – with many of the same drivers. These two trends are certainly not mutually exclusive. We expect to see both (and more) at work simultaneously in a very fluid environment over the next several years. Have the major venture firms been getting a free ride? They have outsourced early stage risk and effort to a coalition of the willing without paying much of a price. Venture capital is a cyclical business, and the question is not whether a correction will occur, it is when, and how deep. When that day arrives, returns on later-stage investments and billion-dollar funds may not look so good. Access to aircraft-carrier-class capital may become tight, and some firms may seek to reoccupy their old early stage territory. Will they still have those people and skills? And will they find that territory occupied by an entrenched force of grown-up seed firms who aren’t in a hurry to give it back? Looking forward again, we expect to see some of the more farsighted V21 firms wade into seed investing in a larger way in order to reassert their relevance in pre-market-adoption phases. Indeed, there are signs of this already, such as Sequoia’s recently announced $180 million seed fund. They recognize the strategic importance of being the founder’s initial lead investor and long-term most-trusted partner, and the outsize returns that have always accrued to the holders of this position. They recognize that their franchises are at risk if they abandon this post. What remains to be seen is whether most firms will treat this as more than a positioning effort. Will the best, most experienced General Partners be leading the seed investing initiative? Will this be their single-minded devotion or occasional vanity project? What priority will seed investments enjoy versus later / larger companies? The effectiveness of the strategy lies in the answers to these questions. At the same time, we expect that other V21 firms will continue their march towards larger, later-stage financings. It is a lucrative business, albeit a very different one, with lower returns but opportunity for vast assets under management and spectacular per-GP economics. Historically this has been a one-way street, with several great venture firms of old having completely morphed into giant growth equity shops once they got a taste of it. The basis of competition will change in this evolved segment of the business as well, emphasizing access to capital, scaling expertise and firm brand. Softbank is not in the V21 but its impact is certainly being felt. Sequoia is raising many billions in its current fundraising cycle. How many other aircraft carriers are now hard at work building their own Death Stars in response? Be intentional. Decide what roles you want your early investors to play. Experienced strategic consigliere? Timely tactical help? Cash and a smile? Think long-term. Be proactive. Identify the investors that can help your company achieve maximum success. Don’t settle for whoever finds you or who someone else decides to introduce you to. Be relentless. Do whatever it takes to win the support of your ideal investors. These decisions will reverberate throughout the life of your company. The early-stage financing world is changing rapidly. But what won’t change is what it takes to build a great company, and the absolute priority and intense difficulty of laying the foundation right the first time. The very best entrepreneurs will be extremely thoughtful about what sorts of partners they seek out and who they choose to listen to. Want to learn more? Read Connie Loizos’s TechCrunch interview with Peter Wagner here.